St. Martin's Press, 9781250078254, 256pp. After decades of sprawl, many American city and suburban residents struggle with issues related to traffic (and its accompanying challenges for our health and productivity), divided neighborhoods, and a non-walkable life. Urban designer Ryan Gravel makes a case for how we can change this. Cities have the capacity to create a healthier, more satisfying way of life by remodeling and augmenting their infrastructure in ways that connect neighborhoods and communities. Gravel came up with a way to do just that in his hometown with the Atlanta Beltline project. It connects 40 diverse Atlanta neighborhoods to city schools, shopping districts, and public parks, and has already seen a huge payoff in real estate development and local business revenue. Similar projects are in the works around the country, from the Los Angeles River Revitalization and the Buffalo Bayou in Houston to the Midtown Greenway in Minneapolis and the Underline in Miami. In Where We Want to Live, Gravel presents an exciting blueprint for revitalizing cities to make them places where we truly want to live. RYAN GRAVEL is the founding principal of Sixpitch and creator of the Atlanta Beltline, the reinvention of a 22-mile circle of railroads that began as the subject of his master's thesis. Today, Gravel is a designer, planner, writer, husband, and father. He is increasingly called to speak to an international audience on topics as wide ranging as brownfield remediation, transportation, public health, affordable housing, and urban regeneration. 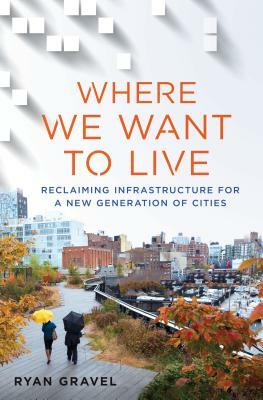 Through keen observation of the relationship between infrastructure and our way of life, he makes a compelling case about how we can shape the future of cities.